Tips for a fun outside family photography session in Portland! When you are raising your kids, you may hope that they grow up as fast as possible. However when you look back after they grow up, most people think they grew up too fast. 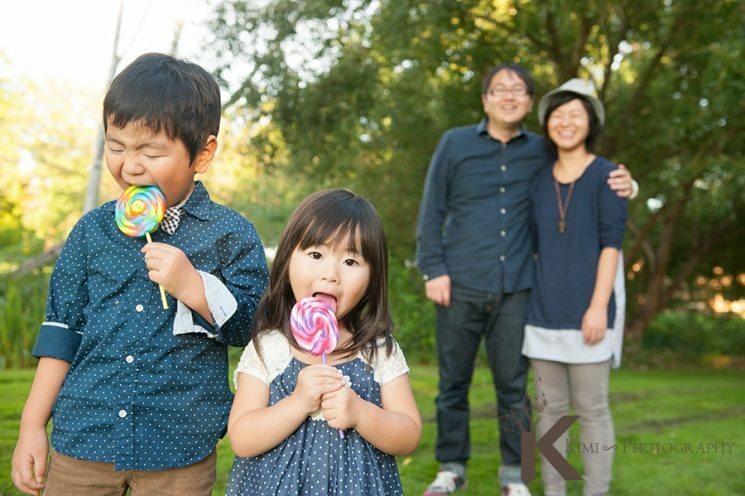 If you decide to have a family photography session in Portland, please contact Kimi Photography. Let’s enjoy the moment of having a family photography session and make it a treasure of your family! To make the family photography session successful, I have some tips to make things smooth. There are also some preparations that we usually ask our clients to take. I will write about those and I hope they give you some ideas of having your family session with us. Unless they are used to being in front of a camera, people don’t know what to do. I am not a person who loves to have my portrait taken, so I know how you feel if you don’t know what to do when someone holds a camera and aims at you! I believe that posing sometimes helps to warm up the session in the beginning. You don’t have to freeze, and I lightly pose most of the time. You can move if you want to. However, it depends on the client. Some people can naturally pose and they know the angles they look better. Don’t hesitate to pose in front of me. Parents can bring out the best smiles of their kids. After we get warmed up, we play tag and play with bubbles! I encourage parents to play with kids at that time. Smiles are just like a chain reaction! If you smile, it catches on and soon smiles are everywhere. Kids love seeing their parents being happy and smiling. Let’s have fun, just like you came over to the park to play! I am sure your kids’ smiles will make you really happy at the session. Kids’ attention would not last so long. I usually bring a few props depending on your children ages. Balloons are always on my list of things to bring for a family photography session in Portland. We can discuss about props when you come to our pre-consultation. Pre-consultation is what we offer before you book with us. It is a great opportunity for you to know about our session and service. So, I would like to know about your children and what props will keep more attention from them!